After 34 years of patient tinkering, researchers at Peru's most prestigious agrarian university have bred a new culinary export they hope will scamper onto dinner plates throughout the world: the super guinea pig. The animal is a cuddly companion for millions of children. But in Peru, the rodent's birthplace, it remains a vital source of protein in rural communities, a mainstay of Andean folk medicine and a common religious sacrifice. "It is well known that Peruvians eat guinea pig. Foreigners are more reluctant to eat it as they see the animal as a pet," said Gloria Palacios, director of La Molina National University's project to promote guinea pig exports. "I think if they become familiar with the cuisine, maybe suddenly they'll give in and be tempted to try it," she said. "It is really delicious." 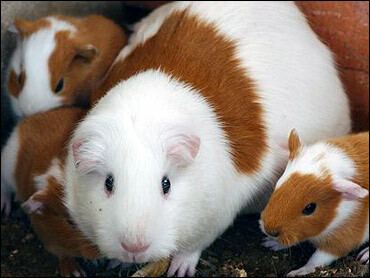 Peruvians consume an estimated 65 million guinea pigs each year. It is a dining experience that normally requires two hands to pick scant, sinewy meat from a bony carcass — often with the head staring up from the plate. But earlier this year, La Molina University started exporting the "Peruvian Breed" — faster growing, plumper, tastier guinea pigs — to the United States, Japan and several European nations that have large Peruvian immigrant populations. The 1,000 guinea pigs shipped out weekly — mostly to the United States — each weigh nearly 2½ pounds, said Dr. Lilia Chauca, head researcher of the breeding project. In comparison, she said, the guinea pigs raised on alfalfa and vegetable peels in 98 percent of rural households in the Peruvian Andes weigh up to 1.5 pounds. The meat is high in protein and low in fat and cholesterol and has a distinctive flavor, similar to rabbit. Chauca and her team of researchers at La Molina's National Institute of Agrarian Investigation started the super-size guinea pig project in 1970. Archaeological evidence shows guinea pigs were domesticated in Peru as far back as 2500 B.C., and had deep cultural and religious significance. Guinea pigs are still a common tool of ritual healers, or "curanderos," who use the animals to diagnose illnesses. A 17th century native chronicler, Guaman Poma de Ayala, wrote that the Incas sacrificed 1,000 white guinea pigs along with 100 llamas in Cuzco's main plaza each July "so that neither the sun nor the waters would harm the food and the fields." From the beginning of the Spanish colonization, the Catholic Church brutally suppressed Indian religious icons. But the guinea pig was spared. Geronimo de Loayza, the first bishop of Lima from 1545 to 1575, refused a request by Spanish priests to order the mass extermination of the rodents, fearing it would spark a rebellion. The Spanish colonizers made Indian artists paint, weave and carve items with Catholic themes to decorate churches and evangelize the natives. The artists copied prints imported from Europe, but added Peruvian touches. Today, churches in Lima and Cuzco still display Indian depictions of the Last Supper with Jesus and the 12 disciples eating roasted guinea pig.